If you are looking for a fun but less expensive way to pass the steamy summer days for your family try visiting city water parks near you. They are great for families with children ages 7 yrs old below. Usually, they cost $3.00 to $5.50 each person and free for children 1 yr old below. 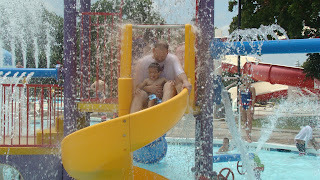 Last Saturday, my family and I were able to see the water park in Arlington city at Randol Mill. I thought it was just like those parks that have water splash and and not a pool . So my husband and I wore shorts and shirt. To my surprise when we got there, I was so stunned to see how nice the water park is. I asked myself why I did not hear about this park sooner. Maybe, because I don't care too much about the events going on in our city. People in the water park were wearing swim suits and ready to swim. While Jason and I were wearing shorts and shirt that look like we were going for a walk! Not Samuel of course. He was ready to swim and wore his new swimming trunk that I bought at Children's Place. I felt a little bit awkward about my outfit but nothing stop me from getting wet and have fun with my son and husband. We had a really fun time at the park with 25-foot water slide, interactive play toys, a leisure pool with current channel and vortex, kid's pool and tot area, bathhouse, and concessions. Who would not think to visit a water like Randol Mill Family Aquatic Center! It's affordable and perfect for small children.